Virgin Australia says improving yield and revenue growth in the key domestic market has led to a strong rise in second quarter profit. The company said on Thursday statutory net profit for the three months to December 31 2015 came in at $60.8 million, a significant increase from $11.3 million in the prior corresponding period. The result was Virgin’s second consecutive quarterly profit, after moving into the black in the first quarter, with the airline group set to post its first full year profit in 2015/16 since 2011/12. 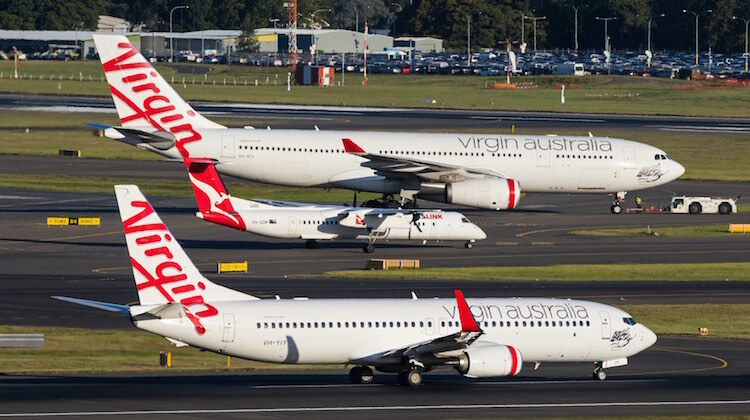 Virgin Australia chief executive John Borghetti said the airline improved its financial and operational performance in the 2015/16 second quarter. “Our performance in the second quarter was underpinned by strong unit revenue and yield growth across the group, particularly in Virgin Australia domestic, ongoing improvement in Tigerair Australia, strong momentum for Velocity and our continued strict cost discipline,” Borghetti said in a statement. Underlying profit before tax, which removes one-off costs and the airline regards as the best indicator of financial performance, came in at $73 million in the second quarter, up from $55.3 million in the prior corresponding period. Virgin’s traffic figures for the second quarter showed the airline’s domestic network carried 4.53 million passengers in the three months to December 31, down 3.5 per cent from the prior year. Capacity, measured by available seat kilometres (ASK), declined 1.2 per cent. Meanwhile, Virgin’s international operations had 2.6 per cent fewer passengers in the quarter, while ASKs reduced by six per cent. Load factors rose 1.9 per cent to 82.7 per cent. Virgin’s wholly-owned low-cost carrier Tigerair Australia reported a 9.1 per cent increase in passengers carried, while demand, measured by revenue passenger kilometres and ASKs both rose by 7.4 per cent. As a result, load factors were steady at 86.5 per cent. The company is due to release its full financial results for the first half of 2014/15 on February 11. Virgin has moved to quarterly reporting of its financial results, in line with one of its major shareholders, Singapore Airlines (SIA). SIA, which accounts for Virgin’s financial performance in its own quarterly reporting, was due to publish its latest results later on Thursday. The second quarter figures indicate Virgin was likely to report a statutory net profit in the vicinity of $62.5 million for the six months to December 31 2015. Good to see they are back in the black. But that result has nothing on the figures Qantas is pumping out at the moment. How much of that profit is due to the lower cost of fuel? Better than a loss but considering the favourable conditions the airline industry is currently enjoying the result is terrible, it will need to have a $300 – $400 million second half FY to be anywhere near market expectations. From an insiders point of view, Virgin has taken cost cutting to an entirely new low. I’m honestly not sure how long this poor performance can be maintained. Staff are worried for their job. JB must go. This doesn’t surprise me that virgin short haul international and domestic are still not up to the flying Kangaroo standard and profits . The last flight I had been delayed and I booked again in faith and you guest it the flight was cancel to the last flight out of Brisbane to Melbourne with no polite discussion to client. I’m back and board the flying Kangaroo for future flights and maybe NZ Airlines need to start flying domestic in Australia. I’m happy I’m not a share holder. Thank God Virgin are making a profit. If Virgin were to collapse, Prices of domestic travel would jump to levels where ordinary Australians’ could no longer travel domestically. Competition has brought airfares down. Can I remind people of a long time ago, under the 2 airline policy of Ansett and TAA. According to the Australia Bureau of Statistics (and from memory), the average wage of a male in Victoria (where I was from) was $282.00. So be thankfull Virgin are making a profit, and all airlines right now for that matter. Things are very tight, but they survive. Sir Richard Branson, cheers! (Virgin) Alan Joyce (Qantas – for starting Jetstar) excellent! Adam Rowe (Tiger Air – not sure of your seniority here), but a great challenger! Australians and world travellers, lets not forget the past history of airfares. Take advantage of these low fares, and fly, not only for your enjoyment, but to keep the fares low, because remember what happens with no competition!